Hello, I`m Mary. Once I had a friend named Martha, but she died a while ago. Then I was an only budgie, except for my toy friend here. So it was just me, and my person, and her little dog. Then my person had to move far away to a new home that had cats. She was afraid I wouldn`t be happy at the home, so here I am at Mickaboo. A single budgie. I`m not a very young budgie (ahem). I`m 7 years old, but that`s young for a budgie. With good food and plenty of exercise, I will live for many years. 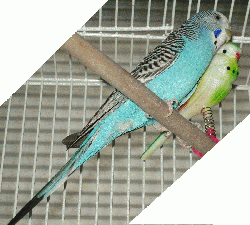 It would be nice to live those years in a nice home with other budgies. How about yours?